The Barson, or Barfreston, mills. The Manor of Soles was the site of the oldest known mill in Nonington and is mentioned in a fine of 1227 and was most probably located on a site just inside the parish of Nonington right on its eastern boundary with the parish of Barfeston near the Barfeston crossroads. This was the site of the much later 18th century Barfreston mills. 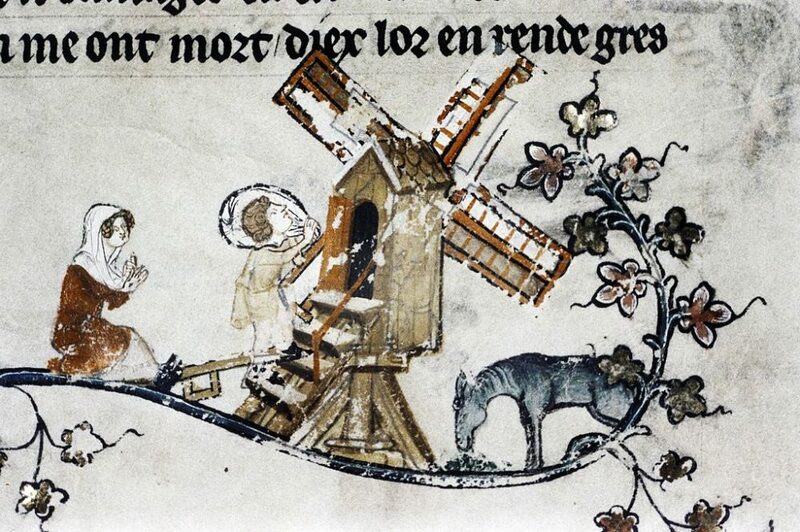 A later windmill, almost certainly built on or very near the site of the early 13th century Soles manor mill, is mentioned in a “Grant in tail male to William Malyverer, esq., for services against the rebels, of the lands called Hertang (Hartanger) , and Paratt’s landis, in the parish of Berston (Barfreston, Kent); also a windmill called Berston Mylle………” made by King Richard III in 1483. 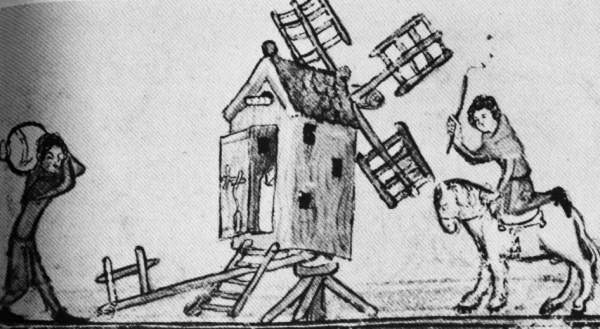 The Barfeston site was an ideal situation for a windmill, being on some of the highest ground in the area, and was therefore also the most likely site of two much later mills which appear in parish tax records from 1765 and on a map in 1769. Evidence of other earlier use of this site may appear in a deed of 1700 which mentions an eight and a half acres toft of land that was part in Nonington, part in Barson (Barfreston) where a malt house had stood. A toft was the previous or abandoned site of a house or building. A John Knott held a victualler’s license in Barson in 1715 although the name and whereabouts of the ale-house he ran is unknown, it was not The Yew Tree at Barfeston, now sadly closed, as this did not become a beer shop until the end of the 1800’s or later. The Knotts lived in Barson Parish and were listed as out-dwellers, or non-resident land-holders, in Nonington Parish tax records. Mrs. John Knott, probably the daughter-in-law of the above John Knott was the occupier of the two windmills on the site in 1765 but her length of tenure prior to this is unknown as large sections of mid-18th century parish records have been lost. The parish tax records continued to list the two mills as having a rent, or rateable value, of £15.10.0 p.a. until late 1821 when William Spanton, the then occupier, moved to the apparently newly built Easole corn mill down the road at the top of Mill Lane. Finch Coles wrote in his book on Kent mills that a pair of mills appeared on 1819-43 maps but only one appears on the 1858-72 maps, the later map appearing to show the remains of one of the mills. 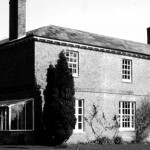 He also reported that: ”From a correspondent I have found a person who, seventy years ago, lived in the base of a mill which was converted into a cottage at Barfreston, and from information gleaned I think there was a smock mill there over eighty years ago (1852), said to have been pulled down because a plantation of trees grew and obstructed the wind”. Both mills seemed to have closed at the same time and they may have become obsolete or expensive to repair resulting in a move to Easole. It seems strange that the mills owner, Mr Plumptre of Fredville, would allow trees to grow on his own land and interfere with the working of two perfectly good mills. Both the Barfreston mills and the new Easole mill belonged to the Fredville estate. The 1839 Nonington tithe map does not record of any mills here but the larger scale and properly surveyed 1859 tithe map shows a round building which is recorded in the 1859 tithe apportionment ledger and the censuses of 1851, 1861 and 1871 records as the “Mill or Round House”. The 1861 census records several railway labourers working on the construction through the parish of Nonington of the London, Chatham and Dover railway line through the parish as lodging at the Round House. 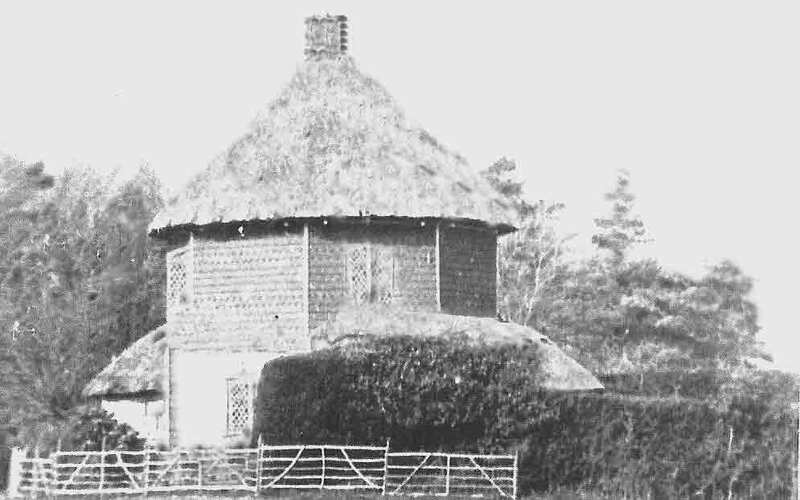 The lost Roundhouse was replaced by a pair of cottage, now a single dwelling with The Wrong Turn micro pub in the grounds. 1483 A mill was recorded at Barfreston, no record of the miller or the previous owner. 1765 Mrs. John Knott, John Knott. Jnr., James Knott. 1821. The mills ceased to operate and Wm. Spanton moved to the Easole corn mill a half-mile or so to the north-east. The mills were then converted into dwellings. The last remaining dwelling was destroyed by fire about 1905.